Today my mom commissioned me an extremely important task: Dessert, gluten-free style. For some reason, a cake was all I could think of, and I haven’t made a cake in literally YEARS. After borrowing a cake pan from my awesome neighbors, I found a recipe that looks incredible (from my recent addiction, mynewroots.org….Sarah B is a genius and she works in the test kitchen of my dream restaurant in Copenhagen, anyway, I digress) and tweaked it a bit to make it gluten-free and compatible with what I had on hand. See the original recipe here, and see all the other recipes, because have I mentioned they’re really effing good? 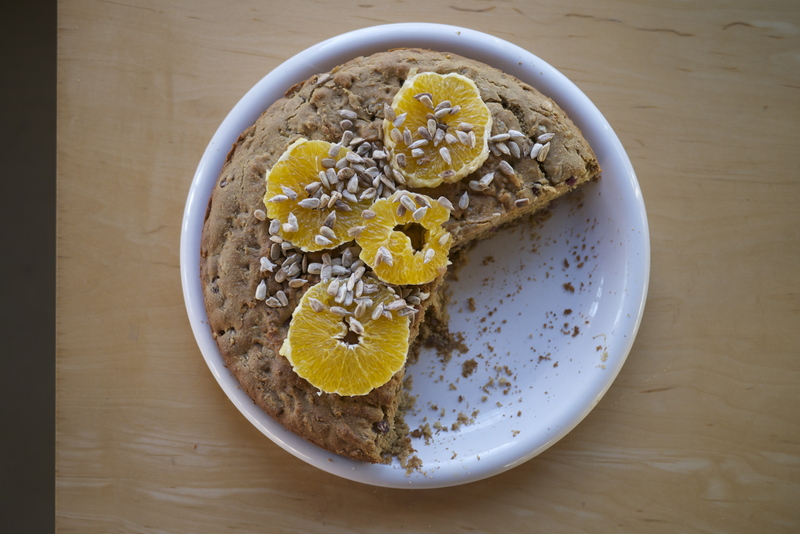 Anyway, I once again used my King Arthur Flour whole grain gluten-free flour mix, toasted sunflower seeds (raw seeds toasted on a dry skillet), pomegranate seeds, and lovely oranges. While not quite a gorgeous as the original, it still came out looking mighty tasty. Preheat oven to 350 degrees. Grease a cake pan with coconut oil or your oil of choice. Combine all dry ingredients, whisk together OJ, tahini, and sugar, fold dry into the wet, and add seeds and fruits and apple cider vinegar. I completely forgot to layer the cake, but it turned out very nicely regardless. Fill cake pan, and bake 30-40 minutes. 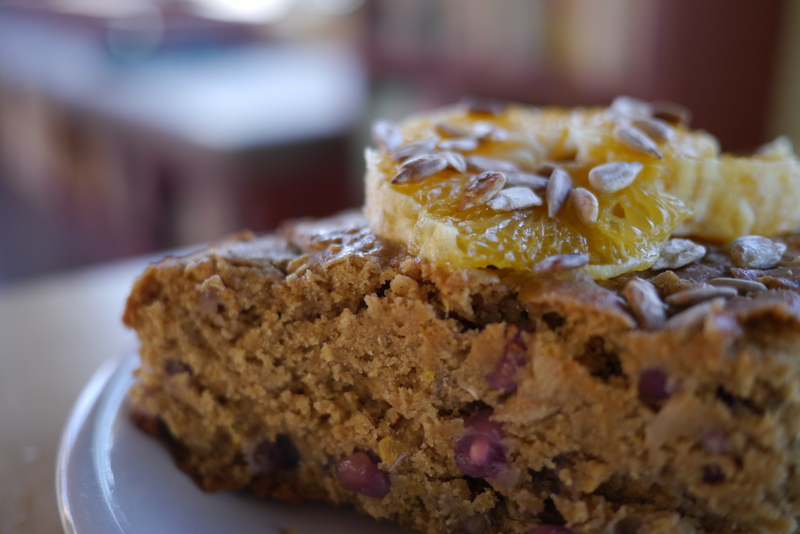 After allowing to cool for 10-15 minutes, remove cake from pan, add orange slices, toasted seeds, and maple syrup. Eat! 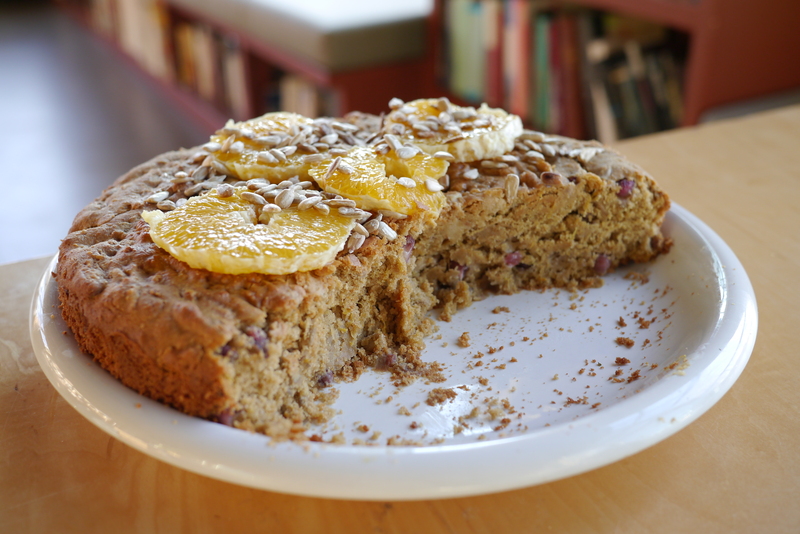 This entry was posted in Uncategorized and tagged cake, gluten-free, vegan by Manders. Bookmark the permalink.